Security researches are gradually raising warnings that the Internet of Things will increase, by multitudes, the number of things that can be hacked and attacked. 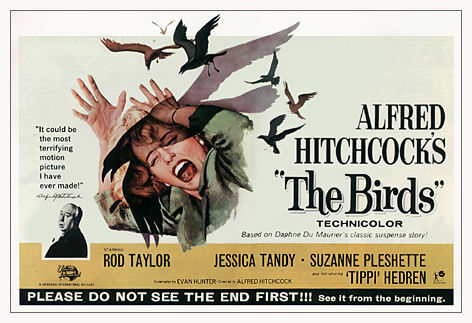 Alfred Hitchcock's 1963 movie thriller The Birds illustrates what can happen when systems are corrupted. The Hitchcockian plotlines are endless. Replace The Birds with flying Amazon delivery drones. Or imagine, as researchers did recently at Black Hat, someone hacking your connected toilet, making it flush repeatedly and closing the lid repeatedly and unexpectedly. With those visions in mind, pay heed to what Internet security firm Symantec says it has discovered: A new Linux worm that "appears to be engineered to target the Internet of Things." No attacks have yet been found in the wild, it reported. But as Alfred Hitchcock once said, "There is no terror in the bang, only in the anticipation of it." The worm discovered by Symantec attacks an old PHP vulnerability that was patched last year, and targets a small subset of Internet of Things (IoT) devices, such as Linux-based home routers, set-top boxes, security cameras and industrial control systems. The worm generates IP addresses randomly, sends out HTTP post requests, and spreads. More broadly, Symantec says that "vendors of devices with hidden operating systems and software, who have configured their products without asking users, have complicated matters. Many users may not be aware that they are using vulnerable devices in their homes or offices." Security researchers do not discount at all the idea that the IoT will serve as a new attack vehicle, but add that the exploit Symantec has discovered likely won't be one of them. Ken Westin, a security researcher at Tripwire, says the exploit targets PHP-CGI (common gateway interface), which most Linux systems don't use. PHP-CGI is usually used in embedded devices such as routers, said Westin, "but the 'Internet of Things' sounds a lot better than 'a few unpatched routers exposed to the Internet running a specific operating system and configuration." That said, the risks posed by the worm does increase the overall incremental risk for unpatched routers and embedded systems "even though the increase is minimal," said Westin in an email. "It serves as a good reminder that there should always be a firewall between routers and the Internet." Security expert Bruce Schneier, didn't address the Symantec's finding, but said he is concerned about the broader risks to the Internet of Things. In many cases, IoT connected systems are using firmware that can be hard to patch. In fact, "in many cases, [it's] unpatchable," he said. There are cheap router chips with "opaque globs" of code and "nobody knows how they work," said Schneier. "There is a race to the bottom by these vendors, because they are all competing on very cheap stuff," he said. "There is a big problem waiting to happen here." Dwayne Melancon, Tripwire's chief technology officer, also discounted the worm, but agreed that it does help raise legitimate questions about IoT security. Many IoT devices are on home networks behind firewalls on wireless routers, so they will be protected from many opportunistic attacks, said Melancon. But "the average Internet user will not be able to tell the difference between secure and insecure devices on their home network. And the fact that many of these devices don't have security of their own will mean that the attack surface of the Internet of Things is going to expand dramatically." Hitchcock was a master at creating the dramatic. Why just imagine what Mrs. Bundy, the elderly ornithologist in Hitchcock's 1963 movie The Birds, might say if her observations about attacking birds was updated to account for flying delivery drones. "I have never known birds of different species to flock together. The very concept is unimaginable. Why, if that happened, we wouldn't stand a chance! How could we possibly hope to fight them?" said Mrs. Bundy.